Do You Feel More Involved When You Help Name Cars? Names are hard. I haven’t had many pets in my life so far, but the three goldfish I’ve named in my life were named after I gave almost zero thought. I think one was named Bob. 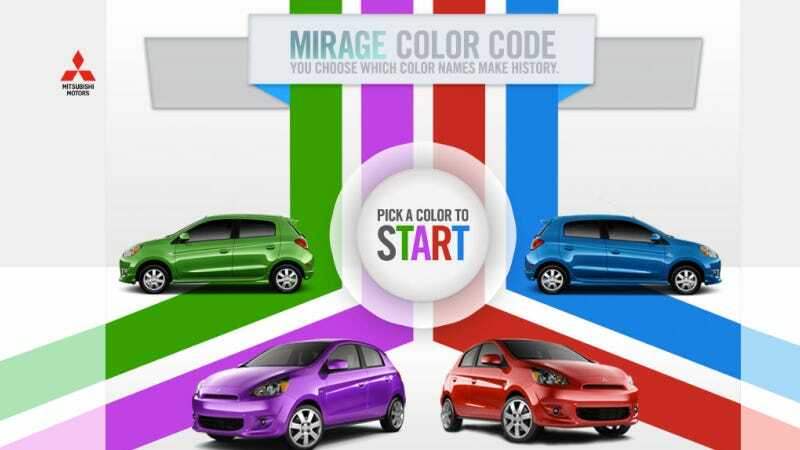 So I did not participate in the recent Mitsubishi social media scheme where people could help name the colors for the 2014 Mitsubishi Mirage hatchback. It ended last week, but not before I took a look at some of the names in the submissions pile. Mitsubishi probably should’ve stuck with the marketing firm. I mean, “Code Red” and “Emerald Isle” as names for red and green? Both of those are soda flavors, right? Maybe I’m too cynical about all of this. Or maybe I think the more simple of a name of the color, the better. Personally, if the Mirage were a car I’d consider buying, I would not like to tell people I bought a Jalapeno Mirage. That just sounds like I’ve gone crazy. And saying my car is a Mirage was already confusing enough. When we say automakers should listen to the public more, we’re talking about insisting they offer a diesel wagon with a stick-shift, not so much debating what colors should be named. But hey, it’s still having input. Do you play along when car companies ask you for name suggestions?